Salam eleykim! Welcome to Azerbaijan. On arrival at Baku Airport you'll be met by a representative and transferred to your hotel (approximately a 40 minute drive). The adventure begins with a welcome meeting at 6pm in the evening, followed by a group dinner. If you can't arrange a flight that will arrive in time, you may wish to arrive a day early so you're able to attend. We'll be happy to book additional accommodation for you (subject to availability). Get to know Baku with a tour of the city, taking in a visit to the Old City, including time at Shemakha gate, Shirvanshahs` Palace, Maiden Tower, Old Market Square and the Carpet Museum. 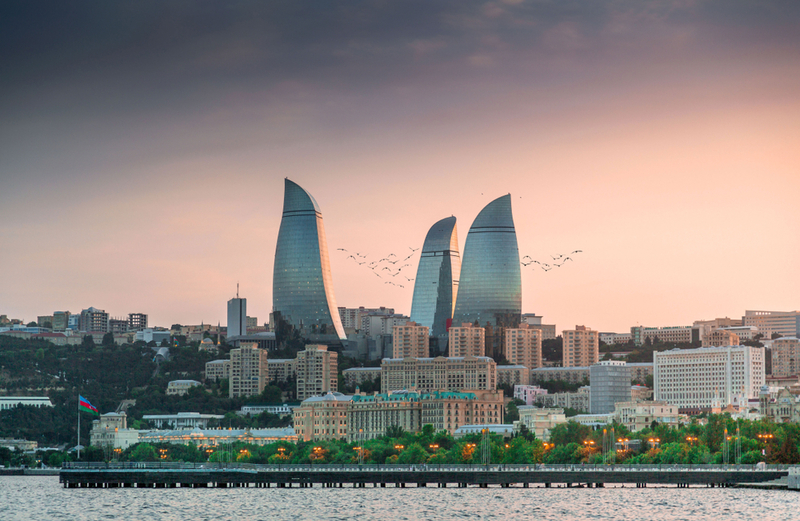 Bring a camera as there will be panoramic views of Baku's skyline to enjoy. Afterwards head out on a tour of the Absheron Peninsula, visiting the Ateshgah fire temple, Mardakan medieval fortress and the eternally burning Yanardagh fire mountain. Return to Baku in the evening. Enjoy a day trip to Qobustan, located around 60 kilometres south of Baku. Visit one of the world's largest open-air archaeological museums and wander past ancient rock art dating back 40,000 years. The prehistoric carvings depict scenes of hunting, fishing and gathering. There will also be an opportunity to see the on-site archaeological museum before returning to Baku. 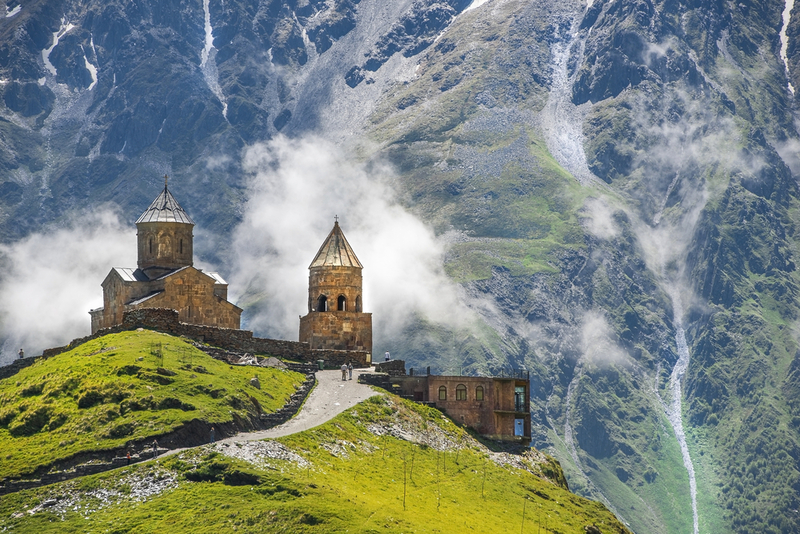 Today, depart Baku and head for the Caucasus Mountains in the northwest of Azerbaijan. Watch arid landscapes slowly give way to densely forested mountains. En route to Sheki there will be stops at an active mud volcano, the Diri Baba shrine in Maraza, the Yeddi Gumbez Tomb, and the Juma Mosque in Shemakha. We also stop in to visit a family to see how they make yoghurt the traditional way and enjoy some local snacks. Have breakfast at the hotel before driving to Lagodecki, a town at the Azerbaijan-Georgia border. Visit a traditional bazaar and then change leader and transportation. From here travel to Georgia's Kakheti region, famous for its wine making and welcoming hospitality. There will be a visit to the Gremi Architectural Complex and its museum, followed by lunch with a local family, which includes delicious homemade cuisine and wine. In the afternoon, continue to a winery and sample different kinds of famous Georgian wines. Listen to unique Georgian polyphonic songs, a traditional style of music prevalent in the Kakheti region. Afterwards, travel to the hotel in Kvareli. Following breakfast, journey to the beautiful 18th-century town of Sighnaghi, known for its quaint stone walls, small houses with terracotta roofs and decorated balconies. After some time to admire the picturesque views of Alazani Valley and Great Caucasus mountains, depart for Tbilisi and explore the capital of Georgia. Wander the old districts of the city, which are structured like terraces, and walk through the narrow streets to appreciate the colourful houses, patterned balconies and revamped modern architecture. 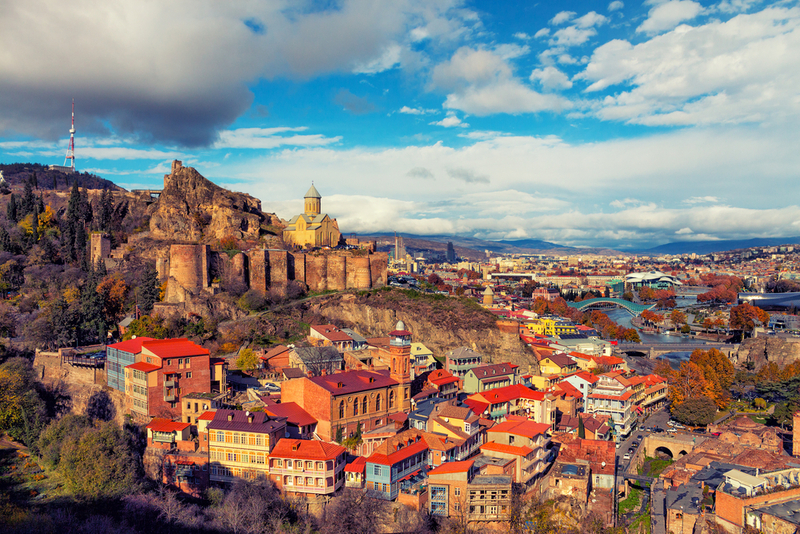 Get to know the city on a walk beginning from the 13th-century Metekhi church, with its magnificent views over old Tbilisi, before visiting the main sights of the city. In the afternoon enjoy some free time. Enjoy panoramic views of the whole town and through the ancient Narikala fortress, then head to the historical domed sulphur bath area. Visit the stunning treasury of the Golden Fund at the Natural History Museum (closed on Mondays), which will prove that Georgia is truly the land of the Golden Fleece. From here visit a local art studio and become acquainted with Georgian cloisonne enamel, also known as Minanqari, and see how it is made. Enjoy an afternoon of free time. 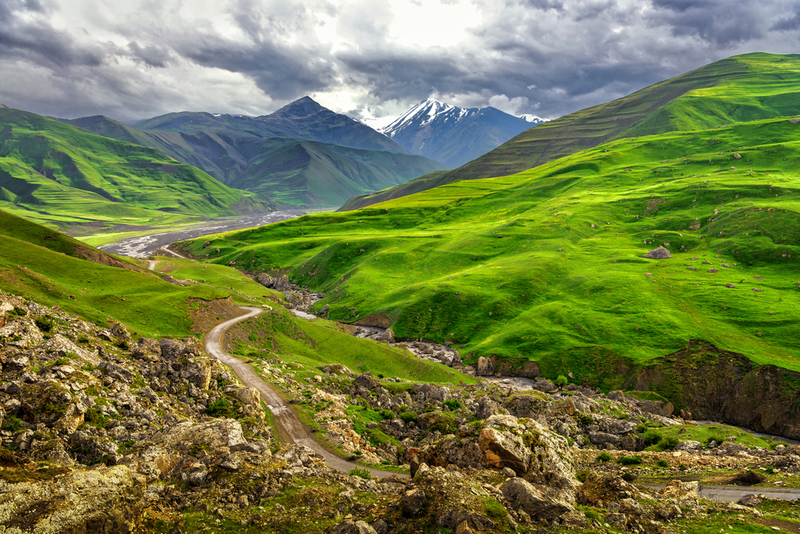 Enjoy a stunning drive from Gudauri along the Tergi River before arriving in Kazbegi. From here it's a leisurely 2 hour walk each way through beautiful valleys and woodlands to Gergeti Trinity Church, located at 2170 metres above sea level. If the weather is good it's possible to catch a glimpse of Mt Kazbegi, one of the highest glaciers in the Caucasus. Return to Kazbegi and then drive deep into the mountains through spectacular Sno Valley, where the exotic small village of Juta awaits. Surrounded by verdant mountains, it's completely cut off from the whole country six months of the year. Ancient ways of life survive here, and visiting the village is a truly unforgettable experience. Meet a local family and learn about their way of life over some tea and honey. Afterwards, you will return back to Gudauri. Enjoy a final breakfast in Gudauri before driving to Sadakhlo, a village at the Georgia-Armenia border. Here the group will change leaders and transportation. Begin the Armenian leg of your adventure with a visit to Haghpat monastery, which is listed as a World Cultural Heritage Site by UNESCO. Haghpat stands as an example of one of the most outstanding works of medieval Armenian architecture. Later, travel to the medieval monastery of Goshavank, comfortably nestled between two hills near the banks of the Getik River. 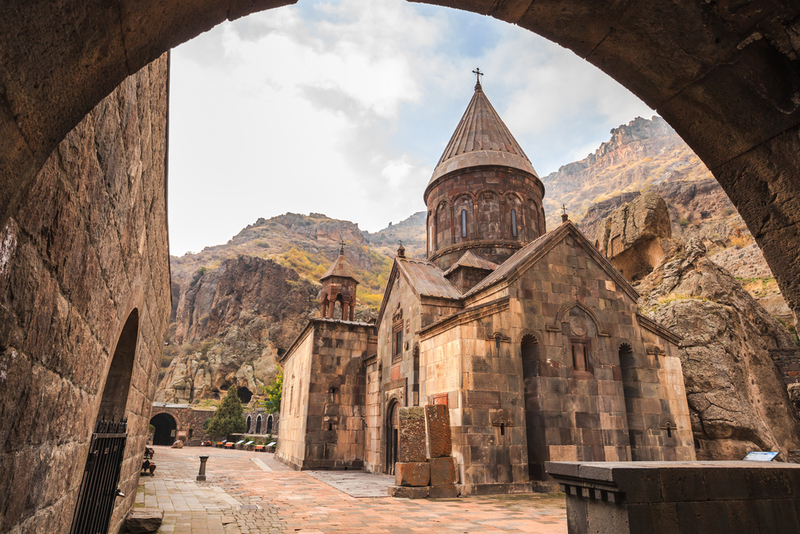 The monastery was the educational, spiritual and crafts center in medieval Armenia and is named after the celebrated Armenian scientist, author and lawgiver Mkhitar Gosh. Afterwards, continue on to the picturesque resort town of Dilijan, often refered to as the “Little Switzerland of Armenia’’. Dilijan's central Sharambeyan Street has been preserved and maintained as a charming "old town", complete with craftsman`s workshops, a gallery and a museum. Stay overnight at a hotel in Dilijan. After breakfast drive to the reflective waters of Lake Sevan, nicknamed “The Pearl of Armenia”. Sevan is one of the largest fresh-water high-altitude lakes in the world. Visit the romantic Sevanavank Monastery, which overlooks the water on the Peninsula. Move on to the village of Garni to visit the 1st century Garni Temple, built by the Armenian King Tiridates and dedicated to Mithra, the God of the Sun. Travel northeast of Garni, higher up the gorge of the Azat River, where there is a magnificent Geghard monastery. The UNESCO World Heritage Site is partly carved out of a mountain and surrounded by cliffs. In the afternoon, drive to the capital city of Armenia, Yerevan. Stay overnight at a hotel in Yerevan. After breakfast, become familiar with the streets of Yerevan on a guided city tour. 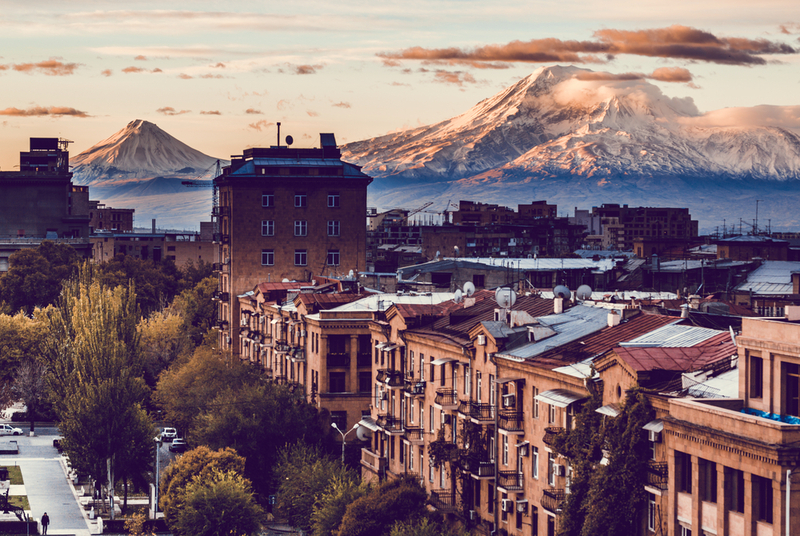 Established in 782 BC, Armenia’s capital is one of the oldest cities in the world. Nowadays it's a lively city, where ancient culture is mixed with a modern lifestyle. Visit the Matenadaran, a depository of ancient manuscripts that contains historical documents from all over Europe and Asia. The building also holds the first copy of the Bible in Armenian. In the afternoon, depart for Echmiadzin, the spiritual center for all Armenians. The legend goes that the Echmiadzin Cathedral was designated in a vision where Christ came to Earth and struck the plains with a golden hammer. Return to Yerevan with a stop at the ruins of Zvartnots Temple, a stunning example of 7th century Armenian architecture. Return to the capital. Hotel each night of your itinerary. All GetAboutAsia accommodation is handpicked by us.